Mrs. Kriese on Count Out Three! Hey people! 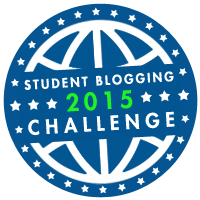 This post is for week 7 of the student blogging challenge; I chose to play the “Count Out Three” game. Hi Dia! I love books and for a year or so the Harry Potter series was at the top of my list of favorites. Although, if I had to choose one person to sit at a table with and talk about books, I would choose John Flanagan. He is not exactly a “celebrity”, but he is the writer of both the Ranger’s Apprentice series and the Brotherband Chronicles (I totally recommend both series if you haven’t read them). Dia’s blog post caught my eye because she says that if she where to talk about a book to a celebrity it would be Emma Watson and talking about the Harry Potter series. As you can tell from my comment, Harry Potter was my favorite series, but then I found the Ranger’s Apprentice series and that stole the position on the top of my list. Don’t get me wrong, I still think Harry Potter is awesome. Conner was writing about his favorite thing is: his family. Family is very important, they are almost always there for you and will help you through hard times if given the chance. Hi Colby! That puzzle is really awesome– I solved it in 6 minutes and 18 seconds. I started off really well, but the background slowed me down because it’s almost the same color, not to mention that on this puzzle I started from the middle and didn’t try to put the background pieces together until the very end. Colby posted an awesome Five Nights at Freddy’s puzzle. Puzzles aren’t really my thing, but solving one every once in a while is fun– especially when it’s Five Nights at Freddy’s! Don’t forget to visit their blogs and check out there posts! A world without color would be a somewhat lifeless world. You wouldn’t be able to see the blueness of the sky, the color of your shirt, or even the color of your eyes. It would all just be black and white. In Lois Lowry’s book, The Giver, no one could see color except for 2 people: Jonas and the Giver. Because of this absence of color, it added to the idea that everyone was the same and that the government wanted to keep it that way. They didn’t know the joys of a sunset, the fun of sitting around a red-orange campfire and roasting marshmallows, or even the colors of a flower. 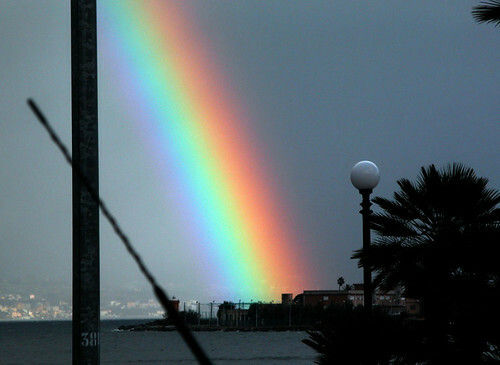 So, if you couldn’t see color then you couldn’t even see the beauty of a rainbow– it would just be a thick grey-ish line in the sky. As you can see, a black and white world would lack many things. At the moment, I am reading the Brotherband Chronicles by John Flanagan. As of now, I am on the 5th book and am almost done with it. The events of the Brotherband Chronicles actually happens right around the time of John Flanagan’s other series, Ranger’s Apprentice. Brotherband Chronicles takes place in the same world as the Ranger’s Apprentice series does, but it’s from someone else’s perspective. As far as I know, there haven’t been any repeats in events from Ranger’s Apprentice in the Brotherband Chronicles. That’s because (for those of you who haven’t read the series) most of the Brotherband Chronicles takes place in Scandinavia. When it doesn’t take place there, it generally takes place somewhere else way far away from wherever Will and Halt (the Ranger’s Apprentice main characters) are located. Hope that wasn’t confusing. Anyway, SPOILER ALERT from here on out. Visit this website for a full summary of each book. The first 3 books are all practically about Hal and his crew trying to get the Andomal (see Wikipedia’s definition bellow) back because it was stolen and it was sort of their fault. In the 3rd book they get the Andomal back and then they are considered heroes. The next 2 books have their own plot. Slaves of Socorro (4th book) is about some Araluens that where kidnapped and taken to Socorro to be sold at the slave market there. Hal (the main character) and his crew then go to Socorro and try and rescue all the Araluen slaves. With the help of Gilan (character/ranger from Ranger’s Apprentice) they eventually do rescue all 12 of the Araluens and bring them all back to Araluen. In the next book, Scorpion Mountain, Hal and his crew embark on a mission to stop the assassins that are trying to kill Princess Cassandra (another character from Ranger’s Apprentice). Since at the moment I am reading this book and haven’t gotten to the end, I won’t spoil it for myself, so if you want to know what happens you should look it up. I really like this series and think that everyone should read it, including you! 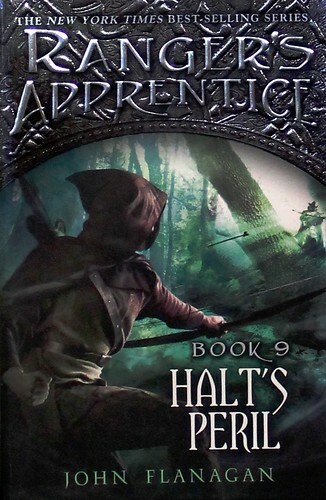 I personally think that the Ranger’s Apprentice series is better, but that’s just me.